Yeah? Give yourself a pat on the back! No? Still give yourself a pat on the back for giving it ago! I cannot wait to start wearing sweaters! I love all of these. I'm following you now on Bloglovin! I'd love for you to follow back! Holy cow, I love all of these! It's so hard to find a sweater with a pattern that works, but these are all such amazing options! Lovely staff!Great blog. What about following each other? Nice sweaters, i´m following you! Yay I got them! I just picked the three most expensive - of course they're the ones that cost the most. Of course. Loving 1 & 3 - such fun colors! 2nd and 8th are amazing! great selection!!! and lovely blog!!! Great collection! Definitely will get one of these. can you follow me in all of them too?¿? 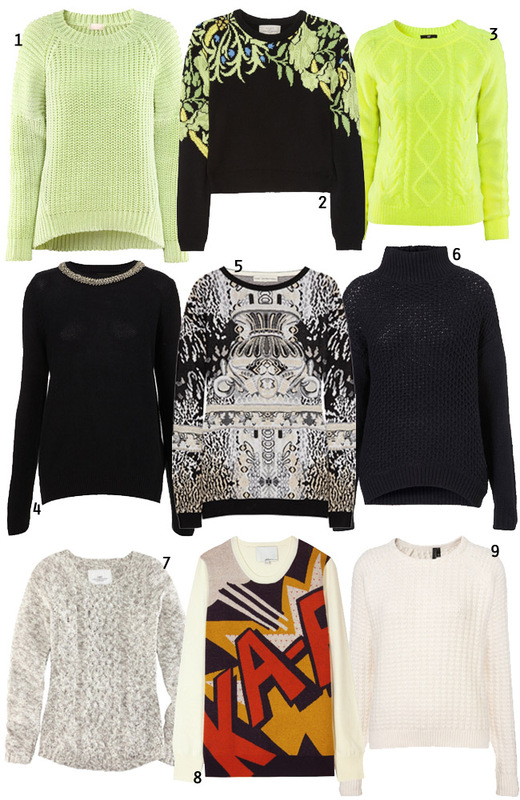 not a huge fan of the neon trend right now but LOVING the neon sweaters you chose! great post honey, i really love the third one! Of course, the Phillip Lim KAPOW is my fave, but also digging the black sweater with the embellished shoulders!